Once you click on Pay Now, a paypal sign up panel will open. Select [Sign Up]. On next panel Select India as country [or your respective country]. Enter your details. You will be next required to enter credit card details. this will be approved by phone call and email. With this you will be good to go for payment using credit and debit card. Its a safe and secure method and is applicable to many online payment and commerce. 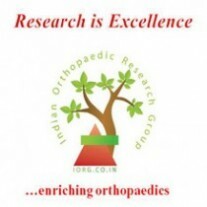 Sending a demand draft or a cheque in name of ‘Indian Orthopaedic Research Group’ payable at Mumbai, India.